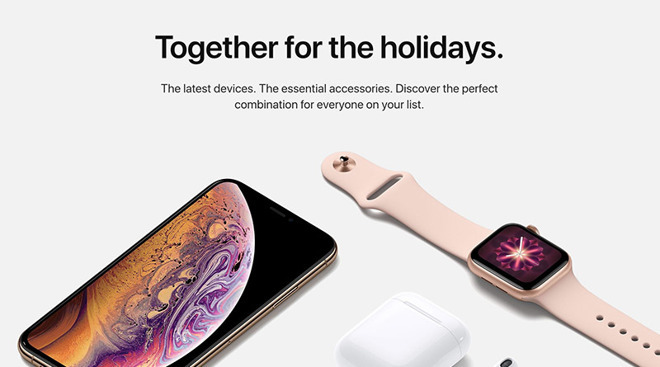 Apple's online storefront was recently updated for the 2018 holiday shopping season. According to new statistics from eMarketer, spotted by TechCrunch, Walmart will capture $20.91 billion online retail spending this year, a figure that equates to 4 percent of the market. The number is up from 3.7 percent in a previous forecast from the same research firm. The performance is expected to unseat Apple from its current spot as the No. 3 online retailer in the U.S. For 2018, eMarketer's latest estimates suggest the iPhone maker will bump its ecommerce share 0.1 percent to end the year at 3.9 percent. Apple is expected to show a net positive of 18 percent, less than last year's growth, due to what eMarketer describes as a domestic slowdown in electronic device sales. By contrast, Walmart's online sales — including profits from Sam's Club and Jet.com — will grow 39.4 percent, a rate bested only by online home goods store Wayfair's 40.1 percent. "Walmart's ecommerce business has been firing on all cylinders lately," said eMarketer principal analyst Andrew Lipsman. "The retail giant continues to make smart acquisitions to extend its ecommerce portfolio and attract younger and more affluent shoppers. But more than anything, Walmart has caught its stride with a fast-growing online grocery business, which is helped in large part by the massive consumer adoption of click-and-collect." Ahead of both Walmart and Apple is eBay, which will see its share of the online market decline from 7.6 percent in 2017 to 7.2 percent this year. Amazon remains king of the online marketplace with a massive 48 percent share of the market in 2018, according to eMarketer's November forecast. The ecommerce titan is due to rake in more than $252 billion in the U.S., up more than 29 percent year-over-year.